Researchers at the National Institute of Standards and Technology (NIST) have used a laser detection and ranging (LADAR) system to image three-dimensional (3-D) objects melting in flames. The method could offer a precise, safe and compact way to measure structures as they collapse in fires. As described in Optica, the NIST demonstration used a commercial LADAR system to map distances to objects melting behind flames that produced varying amounts of soot. 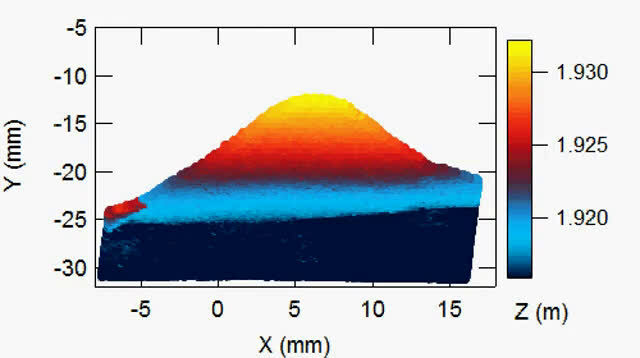 The experiment measured 3-D surfaces with a precision of 30 micrometers (millionths of a meter) or better from 2 meters away. This level of precision meets requirements for most structural fire research applications, according to the paper. "We needed something that doesn't melt too fast or too slow but you still see an effect," project leader Esther Baumann explained. "And I like chocolate." LADAR offers several advantages as a tool for imaging through flames. The technique is very sensitive and is able to image objects even when small amounts of soot are present in the flames. The method also works at a distance, from far enough away that the equipment is safe from the intense heat of a fire. In addition, the instrument can be compact and portable, relying on fiber optics and simple photodetectors. "The project came together somewhat serendipitously when we got 'fire people' talking with 'optics people,'" NIST structural engineer Matthew Hoehler said. "The collaboration has not only been fruitful, it's been fun." The researchers successfully applied LADAR to measure and map 3-D "point clouds"—points are the "voxels" constituting an image—even in a turbulent fire environment with strong signal scattering and distortion. For comparison, the team also made videos of the chocolate as it melted and images of a more complex plastic skeleton. For the melting chocolate, each LADAR frame consisted of 7,500 points sufficient to capture the chocolate deformation process. 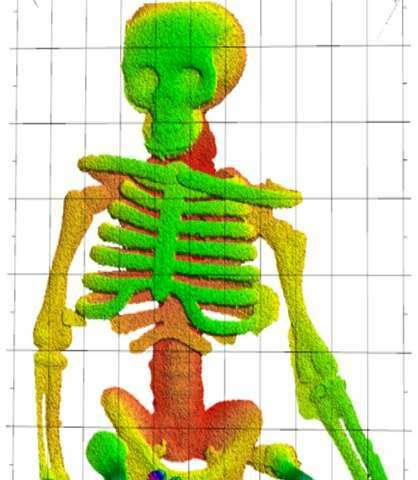 The plastic skeleton was barely visible in the conventional video, but the 3-D point cloud revealed complex shapes otherwise hidden behind flames—details of the ribcage and hips. The initial experiments were conducted with flames just 50 millimeters wide on lab burners at the University of Colorado Boulder. The preliminary results suggest that the LADAR technique could be applied to larger objects and fires. The NIST team now plans to scale up the experiment, first to make 3-D images of objects through flames about 1 meter wide and, if that works, to make quantitative observations of larger structural fires.